As I’ve said, time and time again… every film does not need a sequel. History has told us that it is hard to catch lightning in a bottle twice. We didn’t need Men in Black II, Ocean’s Twelve, The Hangover II, and three more Pirates of the Caribbean movies. So why mess with a good thing? The simple reason is because studios know audiences will flock in hopes that the magic can be recaptured. And every so often they’re right. So once again, here we are. With another sequel to a movie that wasn’t supposed to be a hit (2012’s Pitch Perfect), with our fingers crossed that it will be as good as the original… or at least not a bomb. 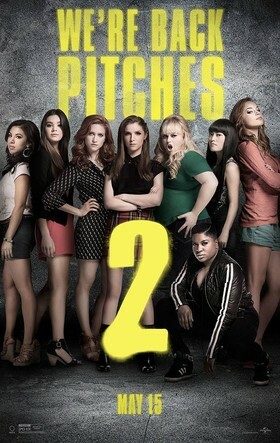 Directed by Elizabeth Banks (who also reprises her role as commentator along with John Michael Higgins), Pitch Perfect 2 reunites the Championship A Capella singing group, the Barden University Bellas; led by aspiring music producer Beca (Anna Kendrick), overly obsessed 7th year senior, Chloe (Brittany Snow), and comic relief “Fat” Amy (Rebel Wilson). The group also welcomes newcomers; Flo (Chrissie Fit), a Guatemalan girl with a knack for bringing up her horrendous, yet humorous past, and Emily (Hailee Steinfeld), a freshman who’s dreamed of being a Bella like her mother once was. After a botched performance that leads to the group’s suspension, the Bellas have no chance but to win the A Capella world championships to be reinstated while also trying to focus on the more important issue of life after graduation. The biggest problem with sequels is that there is big pressure to create a story that manages to recapture what audiences loved about the original, while also managing to create a new challenge so we don’t feel like we’re watching the same thing we’ve already seen. While Pitch Perfect 2 flounders around with a narrative that is all over the place with love stories and subplots, it at least manages to create a story with interesting conflict. The German team, known as Das Sound Machine, is a worthy and comedic adversary and even though the story seems chaotic at times, often delving into the realm of irrelevance, it manages to keep the audience entertained with decent comedic timing and good music. An underground A Capella battle featuring tons of cameos, such as the Green Bay Packers (yes, the Green Bay Packers), is the epitome of this. It’s virtually unnecessary, yet probably the best part of the movie. I’ll admit that at the start of this movie, when the jokes were falling flat, it started to feel like my fears were going to be realized, and Pitch Perfect 2 was going to be flamboyantly hokey. But once things got going, I laughed, I enjoyed the music, and I left with the same feeling of pleasant surprise that I felt after watching the first movie. If you hate the original, you’ll hate this one, but if you loved or just liked Pitch Perfect, then you’ll have the same sentiments towards this one. But, don’t push your luck with a Pitch Perfect 3!!! Ever seen something so crazy, so ridiculous, so chaotic and off the wall that you can’t help, but love it? That’s George Miller’s Mad Max series in a nut shell. First arriving in 1975, with Mel Gibson in the lead role, these films set the standard for post-apocalyptic chaos. Chances are, you’re more familiar with the Mad Max series than you think (Remember 2Pac and Dr. Dre’s “California Love” video). Now, 30 years after the last installment, Miller returns to bring us another peak into the world of ruined Australia. 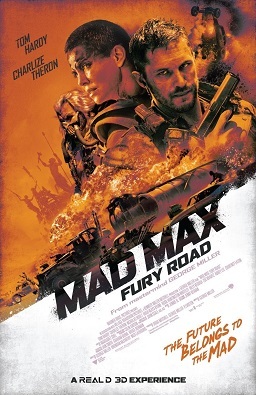 Tom Hardy steps into the lead role as Max, a road warrior now haunted by the death of a loved one he couldn’t save. Hardy picks up well where Mel Gibson left off playing the grizzled loner. This time, the hero gets entangled in a woman’s plot to help a tyrant’s mistresses across the dessert to safety. What ensues is the longest car chase and subsequent action sequence I’ve ever seen, but one filled with interesting characters and jaw dropping practical effects. You don’t need to be well versed in the world of Mad Max to find this film fun. All you need to know about the set up is explained in the first few minutes. But if you aren’t quite ready for the sheer craziness of it all, Mad Max: Fury Road can be a bit overwhelming. Fast cars, explosion after explosion, and kill after kill have this film making Furious 7 look like child’s play. But it isn’t all action and weirdness. Solid characters bring a certain softness to the tone that is a pleasant surprise. Nicholas Hoult is wonderful as Nux, a minion “War Boy” who will do anything to satisfy the film’s brooding villain (Hugh Keays-Byrne) even if it means dying. Rosie Huntington-Whiteley and Zoe Cravitz are smart and humble as two of the aforementioned wives. Charlize Theron, however, is perhaps the biggest draw. The movie may be called Mad Max, but it’s her character Furiosa who is the heart and soul of the film. She is the strong, badass female lead that too many action films fail to bring to the forefront. Mad Max: Fury Road isn’t breaking any film barriers like the original. But with high octane action sequences that’ll keep you far from boredom, coupled with a strong soundtrack, the film feels like a refreshing take on an old classic. While the chaotic nature may be off-putting for some, most will fine this film arguably the most exhilarating of the year thus far.